Is there any difference in the self destructive motivations of these two men? 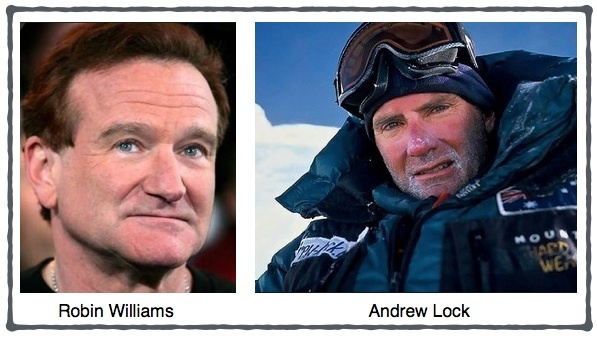 Andrew James Lock is Australia’s greatest mountaineer. He completed his personal mountaineering project to be the first Australian to climb all fourteen “eight-thousanders” (peaks over 8,000 metres above sea level) in October 2009. His first 8000 metre summit was of K2, which he climbed in 1993 with a small team. The mountain lived up to its fearsome reputation when two of his climbing partners were killed in separate falls and Lock rescued a Swedish climber. In 2010 Andrew received the Australian Geographic Adventurer of the year award, for being the first Australian to climb all 14 peaks over 8000m. He has watched helplessly while climbing companions died chasing their ultimate high. He was at the Everest base camp on the day of the mountain’s worst disaster in history – 13 Sherpa and three other Nepalese were all killed in an avalanche. His retirement on his terms, while he is healthy, is a rare thing in a pursuit where death is frequently nearby and frostbite claims the fingers and toes of many.